Bougainville’s Referendum will be the key issue of discussion in the next Joint Supervisory Board Meeting to be held on 20th October in the East New Britain Province. ABG President Grand Chief Dr John Momis said that with less than five years left in the Referendum window (2015 – 2020) the ABG hopes to reach an agreement with the National Government on a) the key questions to be asked during the referendum vote b) the common roll to be used and who are eligible to vote c) the body to conduct the referendum and d) the date for the referendum. “It is very clear that time is not on our side and we must move fast,” the President said. 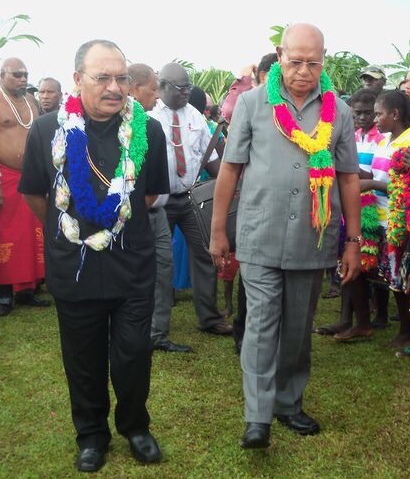 “The ABG has already moved to implement a number of important initiatives that will strengthen the Government and public service machinery to enable it to effectively deliver services to our people and at the same time prepare them for the referendum,” President Momis added. Other proposed issues to be discussed at the JSB will be the slow pace of the draw down of powers, tax revenue collections and a replacement fund to the K500 million Special Intervention Fund in which the final tranche of K100 million will be paid in 2016. “Given the focus of our Government on economic development and fiscal self-reliance, we will propose to the National Government for an investment Development Fund of K500 million as a replacement to the SIF,” revealed President Momis. “We will also be discussing with the National Government possible funding options and strategies for our Kokopau-Buin Highway, this will be an impact project with huge economic development spin-offs for our enterprising population and an impetus for economic recovery,” the President said. Straight after the JSB there will be a Referendum Summit to be held in the East New Britain Province. The object of the summit is to seek a consensus and understanding amongst all key players from the National Government and Bougainville under the peace process and the way forward to staging the referendum and the aftermath issues following the referendum.